Reddit has dug up some brief footage of the Portal environment Valve used to demo the Vive headset to GDC attendees recently. It's taken from a talk by Valve's Alex Vlachos on advanced VR techniques, which he used to boast about the fidelity the development team were able to achieve using high-poly models in a small environment. 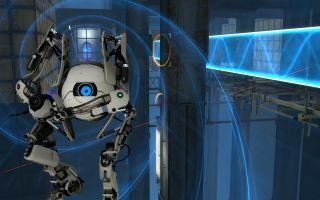 The demo has you repairing Atlas, one of the co-stars of Portal 2's co-op mode. He explodes into his component parts and you have to fix him using the Vive's motion-tracked controllers. Maximum PC caught some of Vlachos' commentary during the footage. "Because you're in this tracked space with this guy and you can walk up and he has all these moving parts. The moving parts alone are like 600,000 triangles or more. I forget the exact number, but there's a lot of triangles there which means you can get incredibly close to this guy and all these parts and see the shape and the details." Valve programmer later Tweeted confirmation that the demo was built in the Source 2 engine. Valve also announced that Source 2 will be free, but users will have to sell their game through Steam (though are free to sell the game in additional ways if they wish). We've tried the VR demo. Here's what it's like to play.